What is it with the “beastly empires” that they don’t even feed everyone? For anyone who’s just recovering from the shock of reading about British “migrant children” forcibly removed from their parents and sent to Australia and other Commonwealth countries, or Australia’s own “forgotten children,” here’s another eye-opener. About 49.1 million Americans (32.4 million adults and 16.7 million children), or nearly 1 in 6, struggled to get enough food in 2008, the highest number in the 14 years since federal survey on “food insecurity” began, the USDA said in a news release Monday. About 14.6 percent of U.S. households, some 49.1 million people, “had difficulty obtaining food for all their members due to a lack of resources” in 2008, up 3.5 percent from 2007. This year’s report also reveals that one third of food insecure households had very low food security (food intake of some household members was reduced and their eating patterns disrupted at times during the year). This is 5.7 percent of all U.S. households or about 6.7 million. This is up from 4.7 million households (4.1 percent) in 2007, and the highest level observed since nationally representative food security surveys were initiated in 1995. 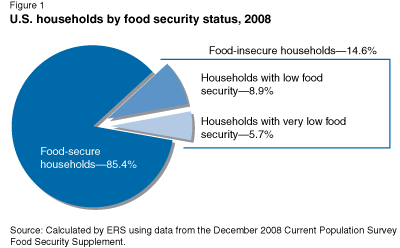 About 5.7 percent of all U.S. households (6.7 million households) including 12.1 million adults and 5.2 million children, had very low food security, up from 4.1 percent (4.7 million households) in 2007, the highest level since nationwide food security surveys began in 1995. USDA’s Household Food Security report, 2008, was based on a December 2008 survey when the jobless rate was well below its current 10.2 percent. The figures for 2009 should be even worse. This post should be read in the context of the US expenditure on the War Racket. Of the Total Outlays (Federal Funds)of $2,650 billion for 2009, the United states is spending $1,449 billion (54%) on the military. What Is “Very Low Food Security”? 98 percent reported having worried that their food would run out before they got money to buy more. 96 percent reported that the food they bought just did not last and they did not have money to get more. 94 percent reported that they could not afford to eat balanced meals. 97 percent reported that an adult had cut the size of meals or skipped meals because there was not enough money for food. 88 percent reported that this had occurred in 3 or more months. 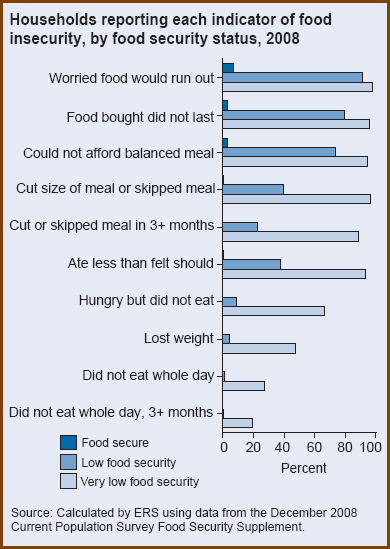 In 93 percent, respondents reported that they had eaten less than they felt they should because there was not enough money for food. In 66 percent, respondents reported that they had been hungry but did not eat because they could not afford enough food. In 47 percent, respondents reported having lost weight because they did not have enough money for food. 27 percent reported that an adult did not eat for a whole day because there was not enough money for food. 19 percent reported that this had occurred in 3 or more months. WASHINGTON, Nov. 16, 2009 – USDA’s Economic Research Service’s (ERS) today released its annual report on Household Food Security in the U.S., which revealed that in 2008, 17 million households, or 14.6 percent, were food insecure and families had difficulty putting enough food on the table at times during the year. This is an increase from 13 million households, or 11.1 percent, in 2007. The 2008 figures represent the highest level observed since nationally representative food security surveys were initiated in 1995. The full study is available at http://www.ers.usda.gov/features/householdfoodsecurity/. Even when resources are inadequate to provide food for the entire family, children are usually shielded from the disrupted eating patterns and reduced food intake that characterize very low food security. However, children as well as adults experienced instances of very low food security in 506,000 households (1.3 percent of households with children) in 2008, up from 323,000 households (0.8 percent of households with children) in 2007. The fundamental cause of food insecurity and hunger in the United States is poverty – marked by a lack of adequate resources to address basic needs such as food, shelter and health care. The Obama Administration has taken aggressive action on these fronts through the expansion of critical services for Americans most in need. The historic investments of the American Recovery and Reinvestment Act of 2009, with a focus on long-term job creation, are a major part of this effort. The Recovery Act provides tax relief for working families, job training, unemployment insurance, income support and affordable housing to needy Americans and their children. A central part of the Recovery Act included a significant increase in nutrition assistance benefits for the 36.5 million people (half of whom are children) who participate in USDA’s Supplemental Nutrition Assistance Program (SNAP), formerly the Food Stamp Program. It also provides resources to the state agencies that administer the program, helping them to deal efficiently with increased caseloads. USDA’s National School Lunch program serves 31 million children a healthy meal each school day – for some children in need, this is their most important meal that day. USDA is working with states to increase the use of technology to make low-income children whose families already receive SNAP automatically certified for free school meals and to promote policies that make it easier for eligible families to participate in SNAP. Also, the Special Supplemental Nutrition Program for Women, Infants and Children, or WIC program, ensures mothers and their children have access to nutritious options as well. Nearly half of all infants in this country participate in WIC. 1 in 6 people hungry! Near East and North Africa boast the largest percentage increase in the number of hungry people in the developing world at 13.5 percent : 42 million. One of the worst years for the hungry, 2009 is experiencing a significant worsening of an already downward trend in global food security since 1996. In 2009 an additional 100 million people had no access to adequate food, with more than one billion people estimated to be undernourished, FAO said.